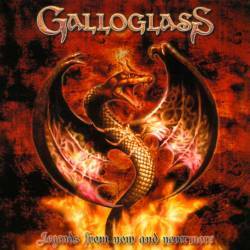 Galloglass come from Hannover, Germany, hometown of bands like The Scorpions, Michael Schenker Group or Victory. Galloglass however go into another musical direction and tend more into a melodic, even slightly progressive power metal direction. You can compare them to early Helloween, Blind Guardian, Fates Warning or Helstar. Power metal bands risk to suffer from weak or annoying vocals. Galloglass however have found in Carsten Frank a man with a superb vocal performance, a real young talent with a crystal clear voice. The opener Dragons Revenge is an excellent metal hymn and at the same time a well promising start. A Wintertale is a beautiful epic song with great arrangements. Although Galloglass are a metal band, I think that their slower songs are the best. A Quest for instance is a quiet folky track in the tradition of early Blind Guardian. The use of flutes give the songs a strong medieval touch. Another strange instrument are the violins which can be heard on several tracks (Ancient Times, Legends From Now And Nevermore, The Conjuring). The album still contains two songs that are just average, but nothing really weak. Galloglass have to be considered as one of the most important newcomers of the German metal scene.